Like a worried war-time family gathered around the wireless, we crowded around a small window in a Greek hotel room to see a torrent of protesters surge around the Landie, hurling rocks and abuse at the riot police. In Tahrir Square we ate roasted sweet potatoes bearing inverted impressions of the anti-government pamphlets in which they were wrapped. In Sudan the people marched in anger at the murder and concealment of two student protesters. It has felt to us as we have traveled that the world is in mutinous temper. Kenya revealed itself to be no exception. While we were discovering Uganda and Rwanda, elections were taking place in Kenya. We had not particularly intended to avoid Kenya during this period but it was a happy coincidence considering their last elections were marred by quite widespread political and intertribal violence. 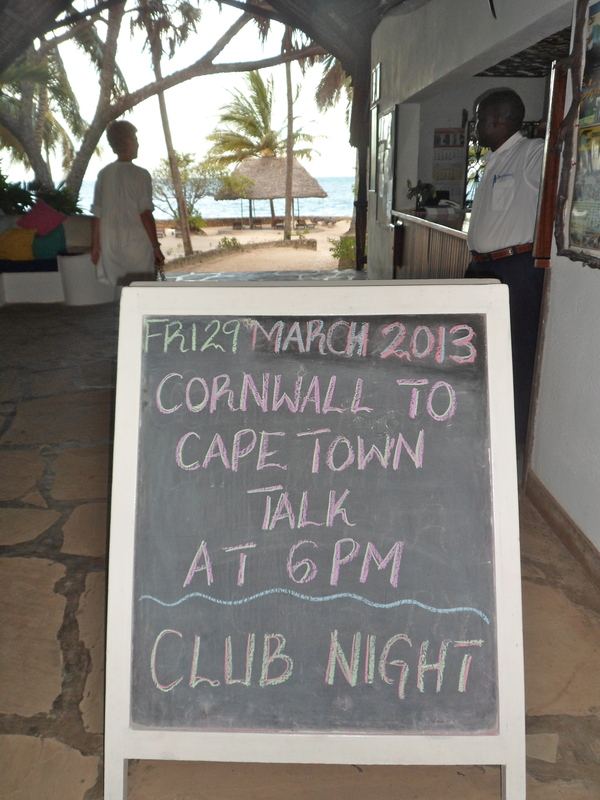 On our return we crossed Kenya quickly, arriving on the Swahili coast after only the briefest of stops to attend a party that confirmed every rumour we had heard about the Nairobi expatriate scene. Our arrival was greeted with the warmest of welcomes from Bas’ parents, William and Lucy Wallace, and their friends Martin and Dawn Whetstone. A wonderful week was spent lounging by the pool, visiting idyllic beaches and mixing with the who’s who of the Malindi social scene. As we sipped cold beers in the Driftwood club we quickly forgot all about our intrepid expedition. We were delighted to be given the opportunity to speak at the Driftwood and tell a few of our tales as part of a cervical cancer screening fundraiser, which was excellent fun. On our final night this paradise was sadly a little tarnished. While sitting up late trading safari stories with the Whetstones and Wallaces, conversation was interrupted by the unmistakable sound of gunfire. Five shots echoed from the night and then it was calm. For several minutes we waited for more, hushed, then a crescendo of automatic fire filled the air. The volleys became more regular as shots were traded. It was a pitched battle between two well-armed adversaries and the sound was close by. David, the askari,estimated that the shots were 200 metres away, near the beach. The clash continued for half an hour and then stopped suddenly. Martin and Dawn were calm and pragmatic as one might expect from old hands in Africa. “We would have heard on the phone if there was something to worry about” said Dawn. We speculated that it might have been Somali pirates fighting the police. Raids on the North Kenya coast were more common a few years previously before the international navy presence in the Gulf of Aden was increased significantly. After a nightcap to settle the nerves we retired to bed. In the morning, the town was going about business as usual, it takes more than a gunfight to upset the balance in Kenya. It transpired that the police had stumbled across a terrorist militia, training in an abandoned building by the beach. In the resulting battle 4 policemen and 8 militiamen had been killed. The remainder of the militia had scattered. The story at the Driftwood club was that Bob, an 80-year-old ex-pilot and policeman, had spent the night keeping watch on his roof with a rifle, while his two askaris patrolled the grounds. It seems that lessons learned in the Nairobi police force die hard. 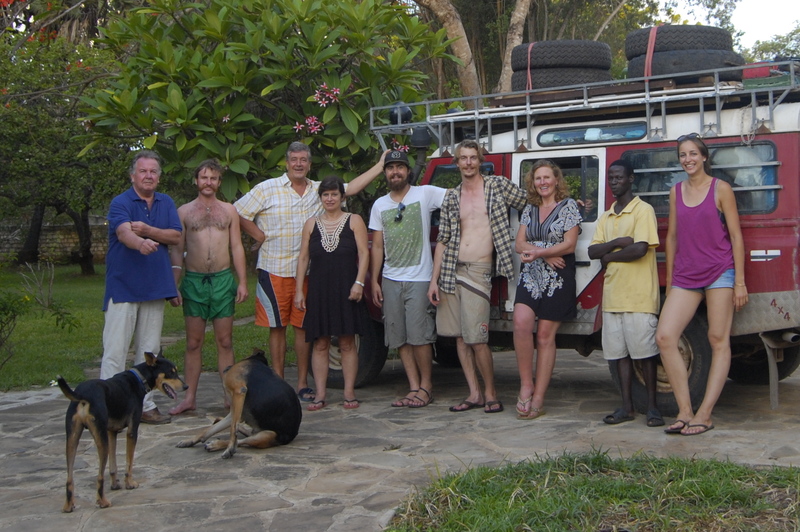 With a fond farewell to the Martin, Dawn, William and Lucy we set off through Tsavo national park on our way towards Tanzania. 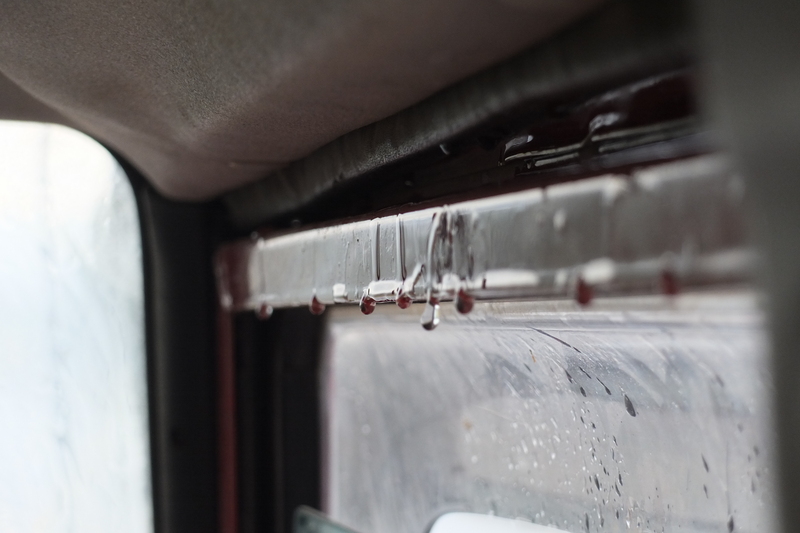 A few hundred kilometers south and the wet season was in full swing, a mixed blessing. At 6 o’clock in the morning during a particularly miserable camp in the gravel of a petrol station forecourt we found ourselves in the heart of a tropical storm. It became apparent that we had pitched our tents in an almost imperceptible trench, which was quickly filled by the deluge, drowning us and all of our sleeping bags with us. On the other hand, however the recent rains had covered the, normally arid, Tsavo savannah with a lush green blanket. 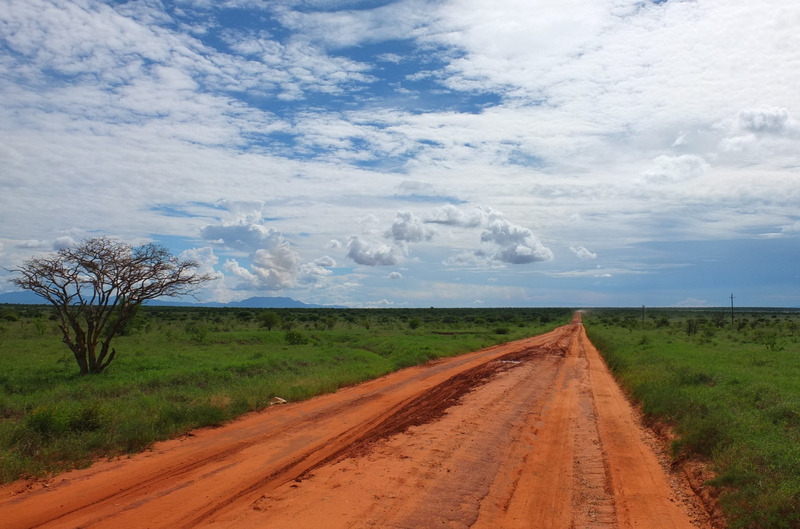 The red dirt track that transected the park was gaudy in its bright contrast to the insufferably verdant plains. The landscape was all the more beautiful, as one is so accustomed to seeing dry African savannah in wildlife documentaries. The Tsavo national park was the stage for the story of the infamous Tsavo Lions. In 1898 the Leut. Col. John Henry Patterson led a project to build a bridge over the Tsavo river as part of the Great Kampala to Mombasa railway. During the project two male lions repeatedly broke into the camp by night and dragged the Indian workers away to devour them. In an effort to deter the animals Patterson built huge fires and thorn fences around the camp. For nine months he hunted the cats, wounding them on several occasions. Patterson attempted to trap the lions by equipping a train carriage with steel barred cage in which two workers slept as bait. In the morning he found the carriage destroyed and the workers abducted. After 135 lives had been lost Patterson finally killed the pair and their huge nine-foot skins spent the following 25 years as rugs in his home before they were retired to a museum in Chicago. This entry was posted in Day to Day and tagged cape town, cornwall to cape town, defender, kenya, land rover, overlanding, overlanding kenya by danielnuth. Bookmark the permalink. It’s difficult to find knowledgeable people in this particular topic, but you seem like you know what you’re talking about! What’s up mates, pleasant article and fastidious arguments commented at this place, I am truly enjoying by these.